Larry J. Sabato's Crystal Ball » Is Clinton slipping? Now, granted, some of this is, for her, bad luck and poor timing out of her control: The “Comey Effect,” referring to FBI Director James Comey’s controversial decision to inform Congress of new emails potentially related to the bureau’s investigation of Clinton’s use of a private email server, has put a dent in Clinton in the final stages of the race, although the contest was tightening in some ways before the news. The campaign’s actions also tell us that there must be at least a little bit of alarm in Brooklyn: It is putting some advertising money (not huge amounts but very noticeable) into some states that the campaign has largely ignored in recent months, like Colorado, Michigan, New Mexico, Virginia, and Wisconsin. Trump has also campaigned in these states recently and has said he is advertising in those states. The pro-Clinton interpretation of these moves is that the campaign is so flush with cash that they can afford some last-minute spending to block Trump in these states; the anti-Clinton view is that the campaign is panicking and took some of these states, all of which are basically must-wins for Clinton, for granted. The good thing for Clinton is that there are few signs that her leads in these states are evaporating. Recent polls of all of these states show Clinton retaining a lead, and not just by a couple of points. A much-anticipated survey from the Marquette University Law School, a solid Badger State pollster, found Clinton up six points, largely unchanged from its last survey several weeks ago. A handful of Pennsylvania polls had Clinton up around four points, not that much different from Obama’s 5.5-point margin in 2012. And a Washington Post/George Mason University poll found Clinton up six in Virginia. Additionally, while polls are all over the map in North Carolina and Nevada, we still see Clinton as a tiny favorite in each state, neither of which is truly a must-win for her to reach 270 electoral votes. Therefore, while Democrats are quite right to be nervous about the outcome, we as handicappers do not at this point believe there is enough of a compelling argument to believe that the race is truly a Toss-up, let alone that Trump is favored. Does that mean Trump can’t win? Of course not: If some of the national tracking polls showing a tie, like surveys from ABC News/Washington Post and IBD-TIPP, are correct, than the election may truly be something of a jump ball, because in a tied national race we don’t see any additional “blue wall” defense for Clinton in the Electoral College. In a very close or tied national race, states like Michigan, New Hampshire, Pennsylvania, Wisconsin, and others could become Toss-ups too. We just don’t think that’s where we’re at, and state-level polling continues to show Clinton leading in all of those vital states. We spend a great deal of time examining poll averages. But it may also be worth examining the preponderance of polls that back one side or the other, regardless of margin. 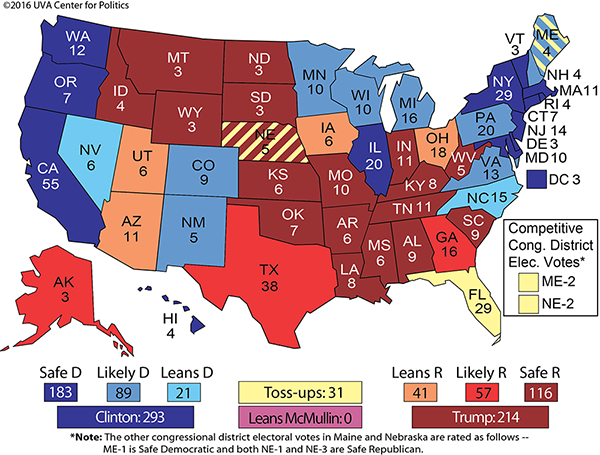 Based on RealClearPolitics’ state-level polling data for 2004, 2008, and 2012, the candidate leading the most polls in a given state usually wins said state. In those three election cycles, there were just three cases where the candidate who led in a plurality of all polls taken from Sept. 1 to Election Day did not go on to win the state: Wisconsin in 2004, Indiana in 2008, and Florida in 2012. There was also one instance where there was a dead-even split in the number of polls led by each candidate: New Mexico in 2004. In 2004 John Kerry won the Badger State by just 0.4 percentage points over George W. Bush. This was a touch surprising because Bush led the polling average by about one point. The incumbent had also led 66% of the polls surveyed there from Sept. 1 to Election Day while Kerry had the edge in just 24% (the rest were tied). In 2008 Barack Obama carried the Hoosier State by only one point, which was remarkable given Indiana’s traditional Republican lean. In that case, Obama had led just 32% of the polls from Sept. 1 on while John McCain had the edge in half of them. Obama also carried Florida by the skin of his teeth in 2012 despite Mitt Romney holding the edge in 49% to Obama’s 46% of the polls taken in the same timeframe. Lastly, the closest state by margin in 2004, New Mexico, saw an even split between Bush and Kerry in the number of polls they led there, with Bush carrying it in the end. Outside of these exceptions, the person leading in a majority of a state’s polls has won that state in the past three presidential elections. Naturally, this finding comes with caveats: First, small sample sizes must be kept in mind. While Florida had 57 polls in the Sept. 1-Election Day time period in 2012, the New Mexico example in 2004 had just 12. Moreover, we are considering data from three elections, which is not a big batch. Second, RealClearPolitics’ poll inclusion/exclusion policy is important — how the site decided to include partisan polls and ones using new methodologies has changed some. Third, 2016 is not necessarily going to be much like the 2004-2012 contests, in part because third-party candidates are likely to win a far larger share of the vote than in any of those three previous cycles. The national third-party take ranged from 1%-2% of the total vote during the 2004-2012 period, whereas Gary Johnson and Jill Stein alone combine for 6.7% in the current RealClearPolitics national average. This creates more uncertainty in the race, as does a healthy percentage of undecided voters. 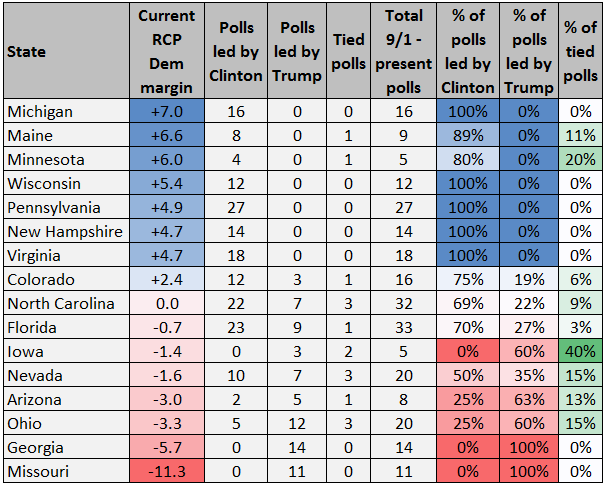 As for what the “poll preponderance” rule of thumb may mean for 2016, let’s examine the 16 states RealClearPolitics includes as battlegrounds, shown in Table 1 below. Since Sept. 1, Clinton has led every four-way poll (including Johnson and Stein) in Michigan, New Hampshire, Pennsylvania, Virginia, and Wisconsin. She has also led at least 80% of the polls in Maine and Minnesota. With the Wisconsin 2004 example in mind, the next four states are certainly of interest. Clinton has led 75% of the polls in Colorado, 70% in Florida, 69% in North Carolina, and just 50% in Nevada. Thus, while we favor Clinton in a couple of these states, we are in a zone where her larger number of poll leads doesn’t necessarily create much certainty. Meanwhile, Trump has led 63% of Arizona polls and 60% of Ohio surveys since Sept. 1. And Clinton hasn’t led a single poll in Georgia, Iowa, or Missouri, though the Hawkeye State has — somehow — the same number of polls (five) in this time period as less competitive Minnesota. This has some bearing on our ratings changes in these states, which are all in Trump’s direction. First of all, we’re pushing all of Idaho, Indiana, Missouri, and South Carolina from Likely Republican to Safe Republican. These were always total reach states for Clinton, and in a more competitive national environment Clinton has no chance to win them. There is some indication that the Comey Effect and Trump’s relatively less controversial close to the campaign are bringing some Republicans home. Monmouth University polled both Indiana and Missouri and found Trump up double digits after he was struggling in their previous surveys. We’re also moving Georgia from Leans Republican to Likely Republican — while the state’s demographics are changing in ways beneficial to Democrats, the Peach State is just a bridge too far for Clinton. 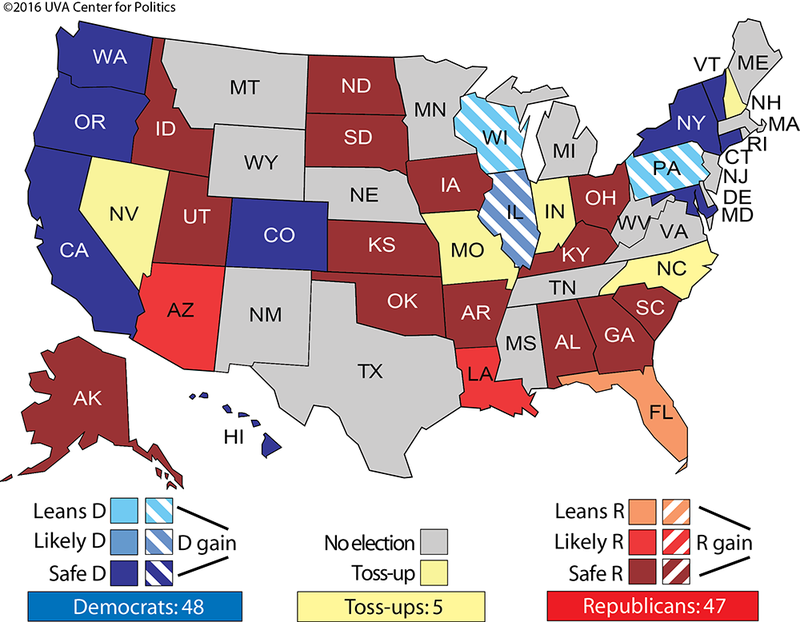 Moving from Toss-up to Leans Republican are three states where the Clinton campaign is still heavily engaged: Arizona, Iowa, and Ohio. The Grand Canyon State seemed gettable for Clinton as of a week or two ago, but while the state has a growing Hispanic population that should weigh heavily against Trump next Tuesday, we sense Arizona is returning to its Republican roots. That’s despite Latino turnout nationally reaching potentially record levels next Tuesday, according to Latino Decisions. Meanwhile, Iowa and Ohio have seemed demographically favorable to Trump for months, and a number of trends, including polling and early voting data, suggest a Trump lean as Clinton’s national fortunes have dipped a bit. Across the nation, early voting trends have hinted at potentially reduced enthusiasm for Clinton among African Americans as Obama leaves the scene. That is a major problem for Clinton in Ohio, where black voters make up somewhere around an eighth of the electorate, or at least they should for a Democrat to win. If that dips a point or two, Clinton is in real trouble. It’s no coincidence that Clinton is personally hitting the Cleveland area hard at the end here, including holding a rally with rapper Jay Z on Friday. Democrats are hoping that their field operation can help them turn things around in Ohio in the final days. Lastly, while we admire an upstart underdog — and Evan McMullin’s conservative insurgency in Utah qualifies — we think a little additional Republican unity across the board should be enough to get Trump over the finish line in Utah, even though the Republican share of the presidential vote there could plummet 30 points or more from Mitt Romney’s lofty 2012 showing (72.5%) in what is a competitive three-way race. Clinton may finish third in Utah, a rarity for a major-party candidate. She wouldn’t be the first Clinton to do that: Bill Clinton finished third in Utah in 1992, trailing George H.W. Bush (first) and Ross Perot (second). It was one of two states where Perot was the runner-up, the other being Maine (Clinton won it, Bush was third). 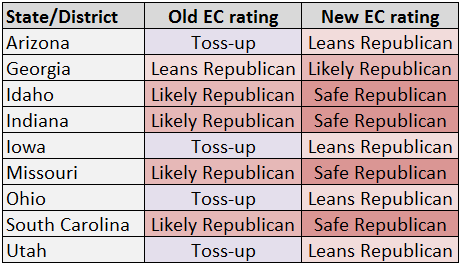 These new ratings leave just 31 electoral votes’ worth of Toss-ups: The big prize of Florida (29), and two votes in Maine and Nebraska’s second congressional districts. Our sense right now is that Florida is a total Toss-up, while Trump may have an edge in the two districts, but we’re not ready to lean any of them yet. We’re holding at 272 “hard” Safe or Likely electoral votes for Clinton, and an additional 21 electoral votes leaning to her (Nevada and North Carolina). Trump is now at 214, better than Romney’s 2012 total of 206, but also without a clear path to add the 56 additional electoral votes he needs to get to 270. Again, even adding Florida, the two Toss-up House districts, and Leans Democratic North Carolina and Nevada would only get him to 266. We also have one major change to our Senate ratings. We’re pushing one of our Toss-ups, Pennsylvania, to Leans Democratic. Katie McGinty (D), Gov. Tom Wolf’s (D) former chief of staff, now appears to lead Sen. Pat Toomey (R) in Pennsylvania. Several recent polls show McGinty running roughly even with Clinton in Pennsylvania, a very good sign for her in the late going. The geographic pattern of the McGinty/Toomey vote versus the Clinton/Trump contest might be interesting: Toomey should be able to do better in Greater Philadelphia than Trump, who is very unpopular there, but McGinty may run a little bit ahead of Clinton in more blue collar parts of the state that are traditionally Democratic but where Trump may improve on typical Republican performance. Still, if this is turning into a coattail race, Toomey finds himself in a tough spot. Finally, a quick word on the House: While Clinton still looks OK in the presidential race, it appears that the door has finally and completely been shut on the prospects for a Democratic House majority. Clinton just does not appear capable of providing the lift required to put Democrats in range of a 30-seat net gain, and House generic polling averages don’t indicate a wave is coming in the lower chamber. There are all sorts of reasons for that, one of which is the power of incumbency, as Alan Abramowitz demonstrates in a companion Crystal Ball piece this week. We will make calls in all the Electoral College, Senate, House, and gubernatorial contests in our final pre-election Crystal Ball on Monday.